It’s no secret that the classic Marshall Super Lead and Super Bass “Plexi” amplifiers produce some of the most sought after guitar tones in rock history. From mild bluesy warmth to the roaring sound of a cranked Marshall stack, these legendary amps laid the foundation for great tones that guitarists still seek to this day. But with vintage amp prices soaring ever higher and the sounds of a cranked Marshall requiring, well, a cranked Marshall, Catalinbread have released what could be the end-all pedal for conveniently capturing that classic Marshall Super Lead/Super Bass sound: the Dirty Little Secret. Catalinbread’s latest Dirty Little Secret is the 3rd iteration of their Marshall-inspired “foundation overdrive” as the DLS has gone through a few incarnations as Catalinbread strove ever towards achieving the ultimate Marshall-in-a-box pedal. But this version may well be the pinnacle of the DLS’s evolution as it finally reproduces the authentic tone stack characteristics of both Super Lead & Super Bass amps, complete with a 3-band EQ and internal Presence trimmer. Here’s a rundown of features before we find out if this is the best “Marshall” distortion pedal around in our Catalinbread Dirty Little Secret review. Classic Plexi to early 70’s Marshall Super Lead and Super Bass sound and response. Master knob controls overall output level. Pre-amp knob sets level of input gain distortion. Bass, Middle, & Treble knobs control tonal response. Presence internal trimmer adjusts overall high-frequency response. Super Lead/Super Bass mode switch selects between 2 difference modes of operation. The Tone circuit gets reconfigured when switched from Super Lead to Super Bass mode and vice versa. Power by 9-18VDC power adapter. Visit Catalinbread for more info about the Dirty Little Secret. This pedal rocks. 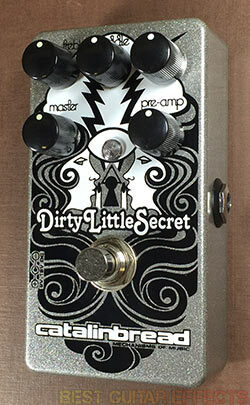 The Dirty Little Secret holds a record with me for being the fastest pedal to win me over from plugging it in to earning a place on my pedalboard. I’ve played a lot of great distortion pedals, even some pedals that capture solid Marshall style distortion tones, but the Dirty Little Secret is truly something special beyond the norm. When first plugging into the Dirty Little Secret, you’ll find it set to Super Lead mode. This mode offers a highly versatile distortion with a focused attack, a searing amount of gain on tap, a tighter frequency response, and an altered tone stack with an upper-midrange emphasis. In short, the Dirty Little Secret is one of the most Marshall-sounding stompboxes I’ve ever plugged into. I generally like to set the Pre-amp knob (gain) pretty high and use the guitar’s volume knob for any subtle tweaks or cleanup. You’ll also notice the feel and distortion character change a little in the upper range from around 3 o’clock to maxed out. And frankly, this is one of the few distortion pedals that I like with fully cranked gain as it can take you into ripping JCM800 territory. Throw an overdrive in front, and Super Lead mode kills! I’ll go ahead a cover the tone knobs before we get into Super Bass mode as it’s vital to understand how and why this pedal’s tone controls are unique and how to use them with best results. Essentially, the Dirty Little Secret was designed to accurately reproduce the same characteristics of the passive tone stacks found in Super Lead and Super Bass amps. Basically, you’re dealing with a real Marshall tone stack, and thus, you’d use the controls on the DLS as you would on an actual Marshall amp. If you’re expecting to just dial the knobs to noon for a flat setting, that isn’t the case here. The controls are passive, so they attenuate, or cut, the frequencies. Also, the Treble knobs works as a sort of blender between the treble and middle/bass frequencies. You’ll generally notice a slight mid-scoop in the sound with more presence in the bass and treble frequencies when the knobs are straight up. When cranking the Pre-amp it may also be worth attenuating the bass to significantly lower levels to keep your bottom end from getting muddy. Otherwise, it’s nearly impossible to dial in a “bad” sound from this pedal, contributing to why the Dirty Little Secret is such a joy to play. The Dirty Little Secret’s Super Bass mode starts by offering a fuller frequency input response compared to Super Lead mode. This immediately gives it a more open sound that’s less compressed and more dynamic. It’s a little darker sounding at first, but you can reduce the Bass and boost the Middle & Treble to find less bass heavy tone if you’d like. Super Bass mode also has less gain than Super Lead mode, but this works exceptionally well if you’re stacking an overdrive or fuzz pedal in front. This gives you an experience like stacking pedals in front of a real amp. You must hear it and feel it to believe how amp-like the Dirty Little Secret is. You’ll also notice that Super Bass mode has a Fender Bassman kind of vibe going on which is not surprising considering that those early Marshall amps were Fender clones. Of course, it still has that distinctive Marshall flavor which is what made the Super Bass a desired amp in its own right. The “British Bassman” vibe becomes even more fun when you stick a Tube Screamer in front for some Stevie-meets-Jimi jamming. Ultimately, the Super Bass mode is this pedal’s dirty little secret and is well worth exploring. It may quickly become your default mode. I expected the DLS to be a good pedal as it’s been growing in repute for a while among players who’ve discovered its charms. But it’s quickly become one of my favorite guitar pedals regardless of its classification as a distortion or Marshall-in-a-box pedal. It just sounds great and is a blast to play through. There are only 2 minor points of fault to consider with the Dirty Little Secret in its present form. For one, the Presence control, while typically a set-once-and-forget parameter, is something I’d like to see receive it’s own dedicated external knob. It’s not a deal-breaker, but it would still be handy for experimentation. Also, and this is a somewhat bigger wish, I’d love to see an external Super Lead/Super Bass mode switch. Frankly, both modes are so different in sound, response, and playability that the DLS really is 2 pedals in one. It would be incredibly convenient to have these great modes accessible without having to open the pedal. This doesn’t compromise my final score as this pedal is supremely good in either mode you should choose. The fact that you do have access to another great mode is an incredible bonus. 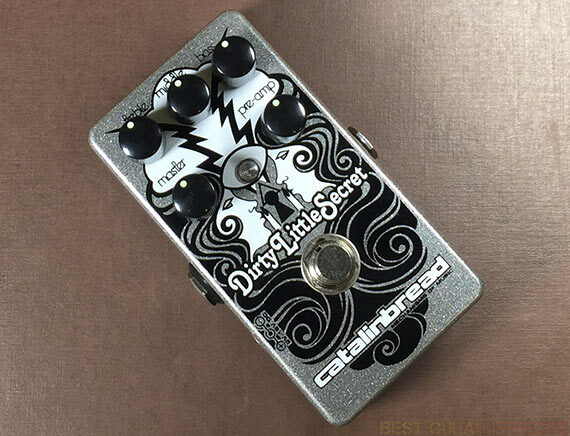 The Catalinbread Dirty Little Secret is rock ‘n roll in pedal form. Let’s see the final result. The Catalinbread Dirty Little Secret is one of the most incredible Marshall inspired distortion pedals I’ve played. It’ll go from classic Super Lead and Super Bass tones all the way to hot-rodded JCM800 style grind. While the default Super Lead mode already offers an incredibly wide range of ways to get your Marshall fix, the Super Bass mode captures a great “British Bassman” vibe that must be experienced firsthand. Super Bass mode is amazing on it’s own or with your choice of fuzz or overdrive pedal placed in front. The Dirty Little Secret rocks hard and is a must-play. That concludes our Catalinbread Dirty Little Secret review. Thanks for reading. 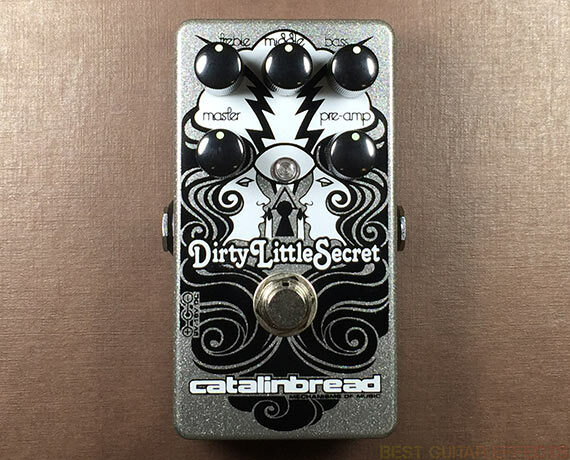 Want to buy the Catalinbread Dirty Little Secret?